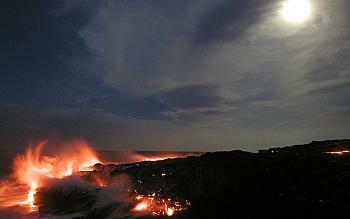 The Hawaiian volcano Kilauea is once again dipping her pahoehoe toes into the ocean. Well, actually, she's behaved far less delicately. After burning a path through the forest and pacing her way over a long stretch in the last two weeks she plunged her fingers and arms full on into the crashing waves, much to the delight of thousands of onlookers. What began as a new vent site on May 12 sent a Mother's Day flow that ignited a 3,600-acre fire as the lava made its way through the forest to the coastal flat below the faultscarp Paliuli. A Buck Moon, one day after full, eyes the east end of Wilipe`a bench at 5:12 am on July 25. Photos courtesy of USGS HVO. "As long as the new vent area kept discharging lava and the upper lava-tube system did not break down repeatedly, it was inevitable that the flow would eventually reach the sea," says Steven Brantley of the U.S. Geological Survey (USGS) Hawaiian Volcano Observatory. Sure enough, over the next five-and-a-half-weeks the flow "slowly worked its way across the coastal flat, feinting this way and that, first to the west, then to the east, then in the middle," according to USGS reports. As arms of the flow reached within 400 and 700 meters of the water, a race began on July 16 between two fingers on the closer eastern lobe. The western finger shot forward in the lead, but the eastern finger quickly followed, closing the gap two days later. On the night of July 18, the lava of the eastern arm, burning famously bright red, poured into the sea at a point now called West Highcastle. 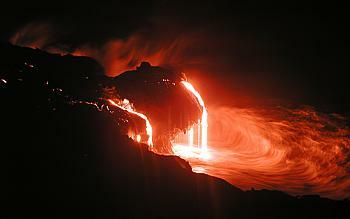 Lava free-falling 4 to 5 meters into the water off the eastern front of West Highcastle bench on July 26. The underside of the breaking wave is lit by the glow from the falls. The next day, the trailing western arm traveled 400 meters in a period of 20 hours gaining momentum for the final 300-meter stretch. A park building stood in the path, but park officials had time to move it before it was destroyed. Crossing the Chain of Craters Road, the western arm dripped and cascaded into the Pacific down the sea cliff of Wilipe`a at dawn on July 21. In the process, the lava drip-castle built a 470-meter wide bench that reaches 90 meters offshore. "One only has to mingle a few minutes with visitors at the entry area and around the budding pahoehoe toes to appreciate how truly awesome most consider the experience of seeing molten rock spread across the ground and spill into the sea," Brantley says. "The number of people going to the entry area every day, sometimes more than 3,000 per day, also makes it clear that the response is nothing short of fantastic."